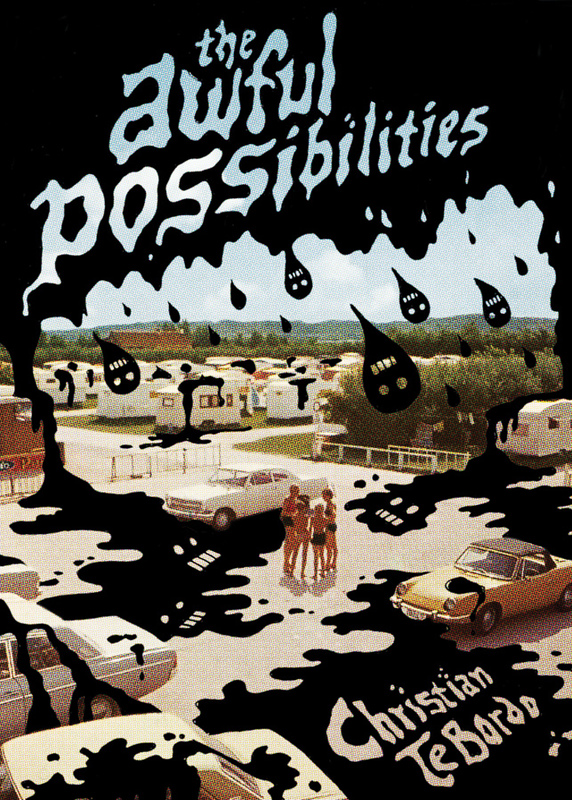 Punctuating the spaces between stories in Christian TeBordo’s collection The Awful Possibilities are a series of postcards, their images disfigured by the skull-faced raindrops that alight across the book’s cover, their words acting out a parody of intimate communications. “Postcards I sent home when we were last on vacation together so that you would have something to look forward to on our return,” reads a line of text at the bottom of each. It’s a strikingly odd sentence, both alienating in its sentiment and tangibly lopsided in its syntax. The postcards make tangible that which is the key quality of The Awful Possibilities: the way in which TeBordo is able to command alienation, both with the subject matter of his stories and the details of his prose. The nine stories contained in this book are often disorienting. Some of the alienation that TeBordo describes is literal: in “SS Attacks!,” the most accessible story here, his focus is on a group of disenchanted high schoolers, with meditations on hip-hop, school shootings, and academic isolation. The disenchantment and separation from a larger community experienced by these characters is, for this story, very literal. In the later “The Champion of Forgetting,” that distancing effect becomes a part of the narrative, as its narrator sets out to tell a story of kidnapping and organ harvesting while consciously blocking out certain elements. Here, as in the later “Took and Lost,” the space in which the story exists seems to occupy a version of the world that is not simply perceived in an unexpected way, but is subtly but fundamentally altered. That layering effect — distanced narrators telling stories from a distance — is both effective and disconcerting. The mood that TeBordo establishes early on in the collection is sustained across nine fairly disparate stories — no small feat. But that approach has its disadvantages as well — the density of the alienation here can be, in places, stifling. It’s something that the ordering of these stories does take into account — the penultimate work here, “I Can Only Hope That He Still Believes In Redemption,” begins with a focus on surreal archetypes, but shifts gears into a minimalist, offbeat take on the shaggy-dog story. In its own way, it’s as discomfiting as anything else here, but it also allows room for a laugh. Which, in a collection as stylistically focused as this, makes for a nice change of pace without disrupting the established rhythm. And in the end, it’s TeBordo’s able evocations of mood that endure: like the ominous pools on the front cover, the sensation it leaves is hard to wash away.